I like making roasted potatoes using both white and purple potatoes and the presentation they make are great. So I was thinking, why not make a purple mashed potatoes? So I decided to give it a try, I combined 6 small white potatoes with 4 purple potatoes and made mashed potatoes just as you would normally made them. The results were less purple than I was hoping for and when I make this again I think I will use a ratio of 6 purple to 4 white potatoes. My creation came out lighter blue/grey. They may not look pretty but they sure did taste good. There is nothing wrong with experimenting. Happy creating. Boil the potatoes until they are tender. Drain the potatoes into a colander and return the potatoes to the pan. Put the pan back on the stove on very low heat for a couple of minutes to evaporate any left over water. Add the butter and mash to the consistency you like. Add milk, pepper and stir. Top with butter. This is a traditional Irish dish and very appropriate to serve on St. Patrick’s Day. In case you don’t know, I am Irish. Mash the potatoes, add butter and milk. Mash until smooth, add more milk if needed. Season with pepper. In a skillet add olive oil and heat over medium heat. Add carrots and cook for two minutes. Add onion and red pepper, cook for one minutes. Add garlic and cook for 30 seconds, season with salt and pepper. Remove to a bowl. Add olive oil to the pan if needed and add the ground beef, season with salt and pepper. Cook until the beef is no longer pink. Drain the excess fat. Add back the vegetable. Add wine, stir and simmer. Add tomato paste and chicken stock, stir then heat over medium heat for ten minutes until all the liquid is absorbed. Add the herbs and simmer for five minutes. Place meat mixture in an oven safe dish. Spoon the potatoes on top and sprinkle the top with parmesan cheese. Put in a 370 oven until the top browns. Let cool before serving. If you can’t get a purple potatoes just use the white. 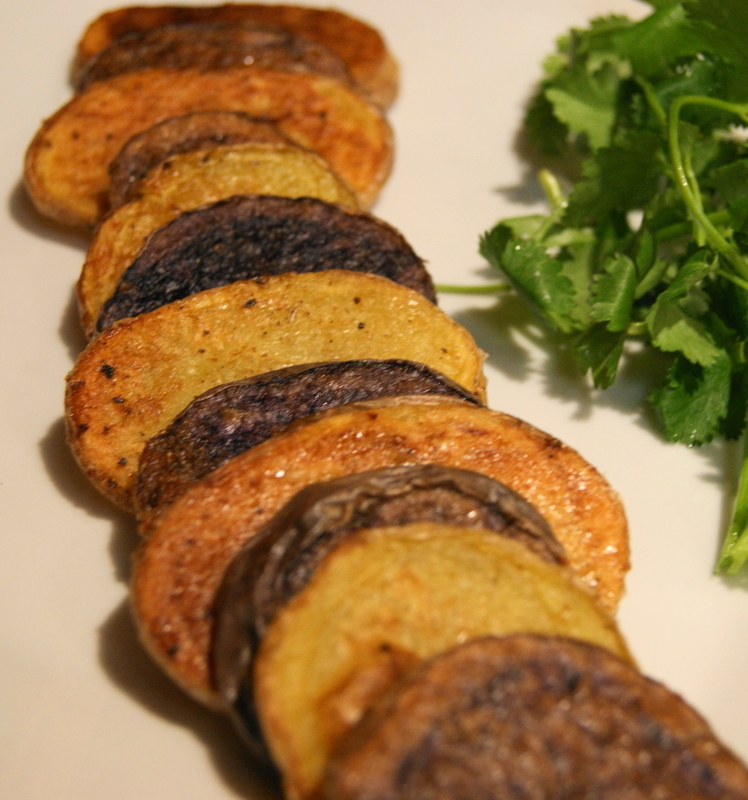 The purple potatoes taste just like the white but it is really impressive on the plate. Slice the potatoes into 1/4” slices and toss with the olive oil and salt and pepper. Place in a baking dish and put into a 4oo oven. Turn after ten minutes then cooked till brown on both sides. If you like them crispy, cook a little longer being careful not to flambé them. 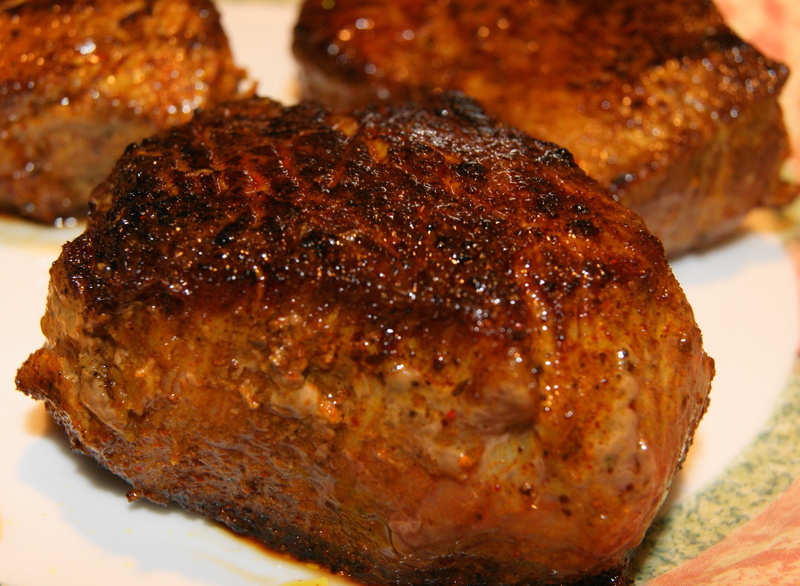 Let steaks come to room temperature. Season each steak with the steak seasoning on all sides. Place on a broil pan and put in a 400 oven. Cook till the internal temperature reaches 145 for medium rare or 160 for medium. Remove from the oven and let rest for at least ten minutes. Slice and serve with roasted potatoes and butternut squash. Place in a baking dish with the olive oil, season with salt and pepper and grate some fresh nutmeg on top. Place in a 400 oven and cooked for 40 minutes. 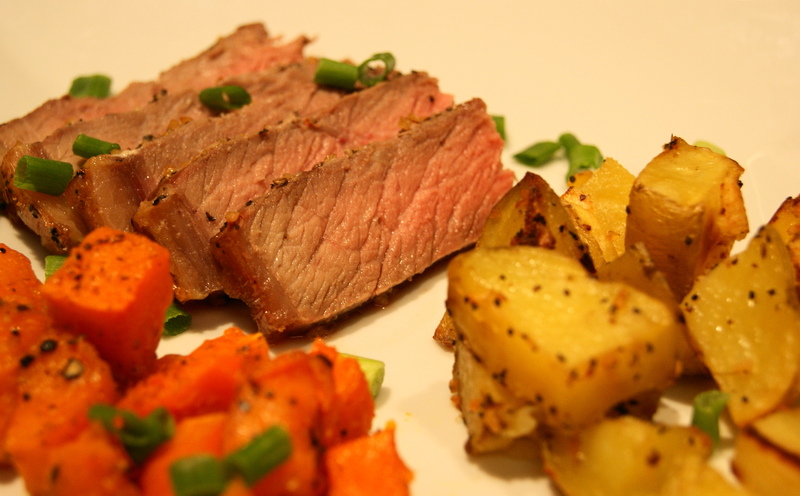 Slice the potatoes into 1/2” cubes and toss with the olive oil and steak seasoning. Place in a baking dish and put into a 4oo oven for minutes.